Alice Through the Looking Glass is the follow-up to Tim Burton's unexpected 2010 smash-hit Alice in Wonderland, plunging audiences back into the bizarre, topsy-turvy world created by Lewis Carroll although, as with the earlier movie, it only bears the most superficial of resemblances to the author's beloved stories. 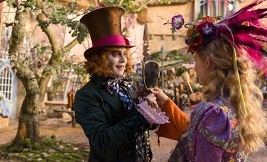 Picking up with heroine Alice (Mia Wasikowska) having disembarked back in England after a host of ocean-going adventures, we then follow her back into Wonderland where she must save the life of her great friend, the Mad Hatter (Johnny Depp). 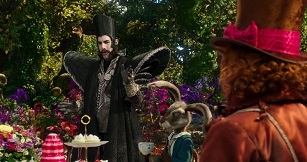 In order to do so, Alice must steal the Chronosphere from the very embodiment of Time himself (Sacha Baron Cohen), in the process travelling into the past to uncover the Hatter's tragic family history. Overproduced, visually overstuffed and bombastic though both Alice movies are, they have allowed composer Danny Elfman to let rip with some of his finest fantasy material in years. 2010's Wonderland was his first fully-fledged excursion back into eye-popping Edward Scissorhands wonderment for some time, following several years of impressively atmospheric, textural scores like Wanted and Standard Operating Procedure. The Wonderland score was most memorable for being anchored around an instantly-memorable sung theme for Alice herself that steadily attained further gravitas and poise across the course of the score. 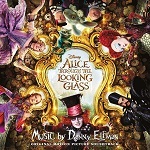 It's this theme that provides the jumping-off point for the Looking Glass score, Elfman not only reinstating it to pleasing effect but also developing it in a host of terrifically exciting and complex ways. The familiar skipping strings of the main theme open the score in "Alice", the choir as before singing Alice's lullaby and taking it to ethereal, spine-tingling heights. However it's Elfman's extension of the piece across six wondrous minutes that really enriches it, the choir underdoing a host of multifaceted changes (including a change from female to male vocals at times) whilst the timpani also gets a pleasing boost. It's a classic example of how musical building blocks can be deepened and intensified for the purposes of a sequel, taking our heroine's destiny in new musical directions. The versatility of the theme is one of the Looking Glass score's main strengths: early on it's applied to an action setting in "Saving the Ship", dramatically flighty string, woodwind and brass passages calling to mind seafaring master Erich Wolfgang Korngold. The ever-present choir is however on hand to remind us that this is a quintessential Elfman score. But it's not the only idea at work: the pizzicato strings, tick-tock percussion and piping choir of "Watching Time" introduce the new theme for Baron Cohen's camp villain, a classic Elfman piece in which the menace is modulated towards the tongue-in-cheek variety. The undulating string work in fact calls to mind Catwoman's material on Batman Returns. The third and final primary idea is the theme for Alice and the Mad Hatter's relationship, one that twists and turns in the movie as she's compelled to go back in time and learn about the Jabberwocky tragedy that befell his family. The strains of Alice's theme give way to some genuinely lovely, heartfelt interactions between strings and piano in "Hatter House", dark, bell-tolling undercurrents hinting at the Hatter's loss of his 'muchness' (in other words, his essence). Later recaptitulations in the emotional "Hatter's Deathbed" and, especially, the beautiful "Goodbye Alice" with its vaguely Celtic echoes of Elfman's 1994 classic Black Beauty, offer some of the composer's most tender material in years. 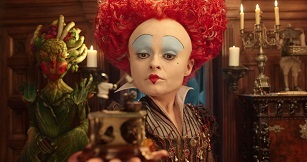 Alice's theme dominates the enchanting "Looking Glass" (containing some exceptional work for chimes, choir and organ) and "To the Rescue'" whilst "The Red Queen" introduces more strident, comically menacing material for Helena Bonham Carter's bubble-headed antagonist, whose role in the sequel has an important link to Anne Hathaway's White Queen. (The track's prominent use of woodblocks and portentous brass chords calls to mind Beetlejuice.) Alice's theme again rises up in wonderfully boisterous, exciting form in "The Chronosphere", emphasising the importance of her mission in retrieving the aforementioned trinket that controls all time. As expected there are traces of Time's own theme mixed in there too, the attention to detail in the orchestration a familiar and pleasing Elfman hallmark as the music zips hither and thither. The Alice/Hatter theme re-appears on some lovely undulating woodwinds in "Warning Hightopps", grounding the zany characters in some recognisable humanity before the lighthearted Time theme emerges once again in "Tea Time Forever", albeit embellished here with somewhat darker choral forces. The soaring "Oceans of Time" sends Alice's theme soaring to especially powerful heights, choir and organ joining forces in the composer's usual fashion; "Hat Heartbreak" meanwhile is one of the score's most charming pieces, plucked strings and gentle vocals adding that irresistible sense of Elfman melancholy before "Asylum Escape" unleashes the full force of the orchestra as Alice's theme is once again applied to a rollicking action context. With its portentous brass chords and racing strings, it's possibly the finest action set-piece in the score. 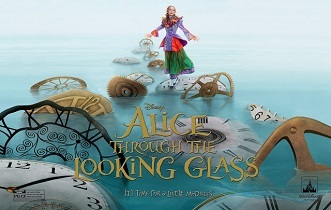 The climax is where Elfman begins to wrap up all of his primary ideas, beginning with the Alice/Hatter relationship theme in the lovely "Finding the Family" before it concludes ominously; that piece then leads into further dramatic variations on Time's tick-tock material in "Time Is Up", which mingles with further explosive statements of Alice's theme as the future of Wonderland hangs in the balance. The ghostly choir/chimes combination of "World's End" calls to mind any number of classic whimsical Elfman scores before the Alice/Hatter theme builds to genuinely stirring heights in "Truth", bringing everything to satisfying conclusion before the final decisive reprise of Alice's theme in "Kingsleigh & Kingsleigh". Following the conclusion of the main soundtrack, we're then presented with a host of additional cues, largely variations on the score's primary ideas. Of note is the bizarrely squeaky, and oddly brief, "Seconds Song" for the villain's minion characters, the impressively grandiose "Time's Castle" and the full-blooded statement of Alice's theme in the conclusive "Story of Time". The obligatory pop tie-in by Pink, "Just Like Fire", then rounds everything off. To quote Lewis Carroll himself, the Alice Through the Looking Glass score could be described as much of a muchness. Quintessentially Elfman, it rolls out all the musical tropes we've come to expect from the clown prince of quirky, from the omnipresent choir to the tinkling chime undercurrent and bouncy brass rhythms. If one were being harsh, it could be described as predictable and a bit samey - but since when does every score have to rock the boat? 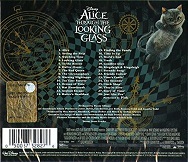 Indeed what the Looking Glass score demonstrates is the wonderful colour and intricacy of Elfman's writing. Even if the tone of it is overly familiar there's always something going on, an offbeat texture or a collision of different moods or ideas, to keep the listener intrigued. It's a beautifully detailed and bustling score that has clearly been crafted with care, and re-affirms Elfman as our primary scorer of all things weird. This film score can be found online at Amazon.co.uk in the UK, or Amazon.com in the US.